The Corporations Act 2001 (Cth) has dual sections that allow the corporate regulator to provide disclosing entities with individual relief from the financial reporting and audit obligations in Pt 2M.3. One section requires public disclosure through gazettal of the Instrument and one does not. ASIC has recently moved to a policy of non-use of the section requiring gazettal and purged the references to Instruments issued under the non-gazettal section from its publicly accessible database. This article addresses the interaction of ASIC’s dual relief powers in respect of Pt 2M.3 financial reporting by disclosing entities. It is argued that ASIC’s disclosure of Instruments of individual financial reporting relief issued to disclosing entities is required or should be preferred. The authors analyse a sample of Instruments issued to listed companies subject to Pt 5.3A. The analysis indicates there is a divergence between ASIC practices and ASIC policies for granting individual financial reporting relief to these companies. This finding adds further weight to the arguments for ASIC’s disclosure of the Instruments. The tumult caused by the global financial crisis has created the economic conditions in which shareholder remedies may be invoked more frequently and consequently the development of the law facilitated. 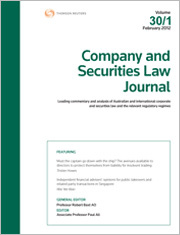 This article examines the shareholder remedies of oppression and winding up with a view to highlighting novel developments such as the Australian Securities and Investments Commission’s use of the public interest ground for winding up and the winding up remedy in the managed investment scheme context. The article also refers to the principles and issues that have remained consistent post-GFC such as the flexibility embodied in the grounds for relief and the overlap between the oppression and winding up remedies. For the full table of contents, click here: CSLJ Vol 29 Pt 2 Contents.